Ann Arbor Debates Deer Hunting Within City, Wide Open Spaces, Dec 29, 2014The exploding deer population in Ann Arbor has sparked a months-long debate over whether to allow hunting inside the city to reduce deer-vehicle crashes and damage to gardens and landscaping, The Ann Arbor News reported. Editorial: Controlled hunt a reasonable option for balancing Ann Arbor’s urban deer population, MLive, December 28, 2014Deer culls are regularly conducted by numerous communities in Michigan cities such as neighboring Jackson, which has carried out an annual hunt by sharpshooters since 2007. While a cull or any other methods of any deer population control are not 100% effective solution, we believe a similar hunt is worth Ann Arbor experimenting with as an economical, safe and efficient approach. Ann Arbor residents ponder: to cull deer or not? MLive, Dec 11, 2014Charlie Fleetham, a consultant hired by the city, said at this point, 45 percent strongly support hunting measures being taken to control the deer population, while 14 percent moderately support it and 41 percent do not support it. Fertility control, sterilization, and trapping and relocating are not currently allowed by the DNR in Michigan. Ann Arbor agrees to pay Humane Society for animal control and shelter services, MLive, July 8, 2014Council Member Jane Lumm called the new contract a big step forward in resolving a difficult and frustrating situation that has existed for many years. Lumm said she also is looking forward to getting a report back from the city administrator by the end of July on options for controlling or reducing the local deer population, another animal control matter the council has been discussing. Michigan city to consider killing urban deer to reduce thriving herd, FoxNews, May 6, 2014An aerial survey of the Marshall Nature Area in northeast Ann Arbor during late last year indicated a deer density of 76 per square mile. That’s far too many, according to Council Member Jane Lumm, a co-sponsor of the bill who claims significant health concerns propels the need for such a solution. Emotions run high in the big debate over deer hunting in Barton Hills, MLive, Feb 4, 2013I’ve been a hunter for 20 years now, and I’ve learned a great deal about the natural world. I’ve learned the natural world is beautiful and serene, but it’s also unforgiving, unfair, stunning, miserable, and merciless. I’ve seen coyotes attack newborn fawns for breakfast while the mother doe could only watch. I’ve seen bucks fight and mortality wound each other. Last fall I witnessed the fatal effects of EHD killing thousands of deer in the State of Michigan, a clear number still hasn’t been determined by the DNR. My point is this; nature in all its beauty is uncaring. Nature does what it does to survive and that’s it. If hunters or sharp shooters don’t kill these deer then your car will, or disease will, or predators will. Authorities to thin deer herd in Barton Hills, Ann Arbor News, Jan 29, 2013Roadway safety and landscaping issues were two of the reasons residents in the affluent village requested the USDA’s services in the matter, Wilson said. Riad Al-Awar, who sits on the village’s board of trustees, said a survey had been sent out to all residents of Barton Hills and that this year the majority of them were returned in favor of thinning the deer herd. Longtime Ann Arbor dentist killed in one-car crash in St. Clair County, Ann Arbor News, Oct 9, 2012An Ann Arbor dentist was killed in a one-car accident Sunday in St. Clair County’s Riley Township after swerving to avoid a deer while driving on Interstate 69, according to reports. Deer Problem in Washtenaw County, Leary Journalism (blog), 2011Perhaps only a paradigm-shifting event like a serious outbreak of disease can create pressure to find a way to reduce the deer population. Washtenaw County’s Taxable Value Falls, The Ann Arbor Chronicle, April 22, 2011During their time for communications, commissioners raised several issues, including: (1) a call to support the special education millage renewal, which is on the May 3 ballot; (2) discussions about consolidating the office of community development, ETCS (the employment training and community services department) and the economic development & energy department; and (3) what to do about the growing deer population. Deer hunting season means big bucks for the economy, Detroit Free Press, Nov 12, 2014Some of the economic impact of the active deer season is seen by auto repair shops. AAA Michigan says 1 in 5 crashes in Michigan involve deer and November is among the top months for such crashes. Last year, the auto club says 12 motorists were killed and 1,200 injured in crashes involving deer. In 2013, there were more than 49,000 such crashes. Oakland County had the most: 1,800. The cost of fixing car damage can easily run into the thousands of dollars. A report last year by State Farm Insurance said the average property-damage cost of deer-car incidents involving its policyholders during the last half of 2012 and the first six months of 2013 was $3,414. Pleasant Ridge is fawning over Baby, an orphan deer, Detroit Free Press, Nov 15, 2014Neither the Michigan Department of Natural Resources nor the Detroit Zoo will take Baby, Magiera said. A few rescue groups have offered to take her, but no one will come to get her, and she hasn’t found a veterinarian that will sedate her in order to move her. Deer wants beer? Rams full-speed into brewery window, MyFox9.com, Oct 30, 2014Employees at Griffin Claw Brewing Company saw the deer running around and started recording. That’s when the deer headed straight toward them, ramming the window at full speed. Deer are on the move in fall, CandGNews.com, Oct 28, 2014A deer-feeding ban remains in place in Rochester Hills, with an ordinance prohibiting the feeding of wild animals other than birds. The ban is intended to reduce the travel patterns of deer from their natural habitat into neighborhoods where feeding stations and bait piles are provided — crossing roads and causing crashes. Rochester Hills City Council President Gregg Hooper said he is joining this year’s statistics on deer/car crashes. 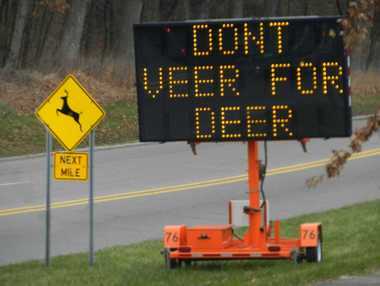 Oakland County Top for Deer/Vehicle Crashes: ‘Don’t Veer for Deer,’ AAA Michigan Warns, White Lake Highland Patch, November 12, 2014One in five vehicle crashes in Michigan involves deer, which are especially active during the November rut, or mating season. Deer remain in crosshairs at area parks According to Oakland County Parks Natural Resources Stewardship Program, overbrowsing can alter the structure and composition of plant communities. The damage to the natural community can be seen by how long it takes the native forage plants to regenerate. Many can require up to 10 years to recover, and that’s only after the deer population is controlled. Deer impales itself trying to jump cemetery gate, Eye Witness News 3, Oct 11,2013The deer was discovered dead early Friday morning by someone working at the cemetery. It’s believed the deer was an eight-point buck and appeared to have been trying to clear the gate when part of its hind quarters caught on a spike. Hills deer crashes creeping upward, Rochester Media, Oct 23, 2012Car/deer crashes have dropped significantly in Rochester Hills since the deer herd was decimated by epizootic hemorrhagic disease in 2009. 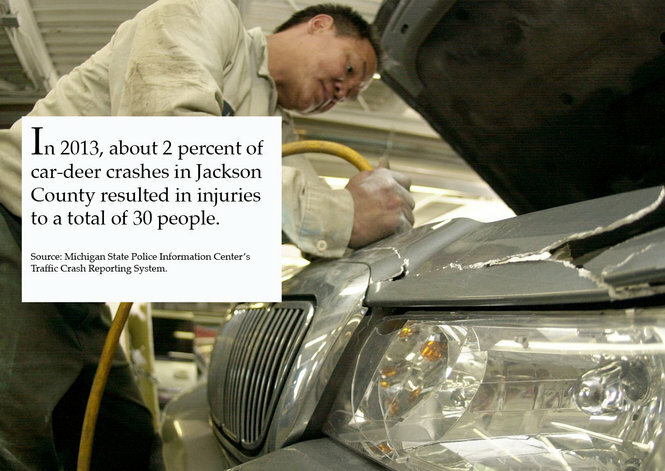 But such crashes were up slightly in 2011, with the city recording the second-highest total in southeast Michigan. Oakland Township was ranked third. Deer herds could devastate Oakland County’s landscape, Detroit News, March 28,2009The reality of this devastation will begin to become very obvious when the population of deer in Rochester Hills exceeds 3,000. Those deer will need to be consuming 15,000 pounds of plant materials each day, and that much food will not be there. By then, the understory of any area of woods will be bare. No new trees will be growing in the woods in Rochester Hills for many decades. Hunters on Genesee County park land have to take an antlerless deer before they take aim at trophy bucks, MLive, Sept 23,2013Hunters will have to harvest an antlerless deer first — an effort to help cull what appears to be a growing deer population at the property that makes up the E.A. Cummmings Event Center in Genesee Township. Hunters on Genesee County park land have to take an antlerless deer before they take aim at trophy bucks, MLive, September 28, 2013Hunters will have to harvest an antlerless deer first — an effort to help cull what appears to be a growing deer population at the property that makes up the E.A. Cummmings Event Center in Genesee Township. Vehicle/deer crashes increase in Macomb County, Macomb Daily, Oct 3, 2014The average cost of damages resulting from a car-deer crash is $2,200, based on surveys of insurance companies around the state. That amounts to approximately $130 million a year in Michigan. But the number of car crashes with deer, and their costs, could be underestimated. “Coverage is under the comprehensive portion of the policy and that’s optional coverage,” Conarton said. E.L. continues conversation about deer population in the city, StateNews, Nov 5, 2014 In 2011, the city conducted an online survey asking residents how concerned they were about the presence of deer in the city and the safety issues having deer around can bring to residents. According to the city of East Lansing’s survey summary, 60 percent of the 245 respondents reported to have some type of concerns about the deer population in the city — 68 percent of the respondents reported to have concerns about the safety threats that deer can impose on residents, such as car accidents involving the four-legged animals. Meridian Township Takes Unique Approach to Deer Management, MUCC, Sept 29, 2014The managed hunt is NOT open to the general public and only about 70-75 approved, qualified, competent and experienced deer hunters will be allowed to access Township property for the managed harvest. The hunt is open to archery use only, though nearby private properties can still use firearms on their own property. Meridian Township hosts another deer harvest this fall, Sept 12, 2014Meridian Township continues to receive numerous complaints of deer over-population that have resulted in an increase of damage to landscaping, an increase in reports of vehicle/deer accidents, concern for public health and a disruption to the ecological balance of natural areas. Deer Encroachment and Damage in East Lansing Neighborhoods, EastLansingInfo.org, Aug 21, 2014City of East Lansing is currently addressing the deer problems via a feeding ban ordinance, but to date has no formal deer management plan. Damages to private properties for some neighborhood residents are reported by them to be in the thousands of dollars. Meridian Township Looking To Expand Deer Hunt, WILX.com, Aug 19, 2014Overpopulation of white-tailed deer is causing problems in the area, from ecological damage to car-deer collisions. Last year there were 180 of those accidents in the township. Bucks, Does Invade City, Businesses, Residents, Windstar Wildlife Institute, Nov 2010“The only way to manage the deer population is through lethal control–but that’s much tougher to do inside of city limits,” the DNR’s Clute said. It would be up to Lansing to tell the department about its deer problem, Clute said. He added that it’s possible the DNR could work with the city to hire sharpshooters to kill some of the animals. “But we could only do this if the city decided to waive their discharge ordinance,” Clute said. “And if they do that, it’s very time-consuming and expensive to kill them. There are no easy answers.” Clute said the primary means of thinning the herd is also the most unpleasant. Dodging deer: Jackson County remains a hotspot in the state for car-deer crashes, MLive, Sept 25, 2014In 2013, 464 car-deer crashes occurred on an interstate, state route or U.S. route and five occurred on roads with an unknown classification in Jackson County, according to the Michigan State Police Information Center Traffic Crash Reporting System. Culling deer herds humane solution, Mining Gazette.com, Aug 14, 2008Culling deer herds is the most humane solution. It seems like a contradiction to suggest that killing deer would be kind. But consider the carnage on countless Michigan roadways and it’s clear that there are too many deer in Michigan, especially southern Michigan. It also means disease for deer, an increased exposure for humans to the diseases they carry and, ultimately, slow starvation for deer herds in the winter. Blandford Nature Center plans three hunts for fall as deer damage shrubs, native flora MLive, July 21, 2011Steinman knows the deer are there. This year’s crop of trillium disappeared within a week of blooming. Steinman hasn’t seen much of the adults, but the young fawns are evident as are the places they all bed down. Which is why Steinman recently announced the center once again will hold a managed fall deer hunt on the property. Down firearm deer hunting season expected for Southwest Michigan as herd recovers from EHD, MLive, Nov. 10, 2014Hunters in Southwest Michigan may see more deer during the Nov. 15-30 firearm season than last year, but the deer herd is still down significantly from previous years as it recovers from disease outbreaks that ravaged the population in 2012. Despite drop in deer numbers, crashes still increase in fall around Holland, Holland Sentinel, Oct 14, 2014The top five counties for crashes in 2013 were Oakland (1,801), Jackson (1,480), Kent (1,447), Lapeer (1,229) and Montcalm (1,073). Deer overrun Hillsdale, Detroit Free Press, Feb 21, 2010In the 1990s, Mike Mitchell was the city manager in Roscommon, an Up North town at the heart of the annual fall deer hunting mania. But he says that he never really saw large deer numbers until he moved 200 miles south to Hillsdale, near the Ohio border. Deer plan delays the inevitable “Bambi” is a great book and animated cartoon. The belief that Bambi goes on to live a beautiful life with his woodland friends, however, is not exactly based in reality., Grand Haven Tribute, Dec 2, 2013By culling the herd in a safe, deliberate and effective manner, we could also donate the meat to help stock the refrigerators of our neighbors who have fallen on hard times. This could be a case of two birds with one stone. It’s time for our council to bite the bullet on this one and make the tough call. They’re never going to make everyone happy, but that’s the nature of the job. Deer/vehicle crashes likely to increase in coming weeks, The Hastings Banner, Dec 17, 2014One in every five motor vehicle crashes in Michigan involves deer. With one of the two most dangerous months for deer crashes here — October and November — a traffic safety coalition is unveiling a new video aimed at deer crash safety messages for young people. — around the state, check out Michigan under the Press/News By State link.